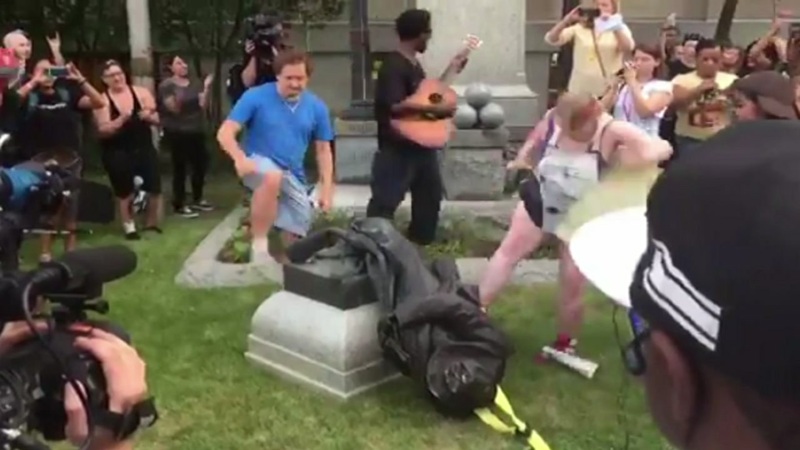 Raw video: Durham protesters pull down Confederate statue. DURHAM (WTVD) -- Recently, you've heard ABC11 reporting that members of the Workers World Party (WWP) are being accused of destroying a Confederate statue in Durham. But what exactly is the WWP? It's a communist party that was founded in 1959 by a group led by Sam Marcy of the Socialist Workers Party. The group supports myriad issues including anti-racism to anti-imperialist struggles. The party is active in the Black Lives Matter movement and supports the struggles of the lesbian, gay, bisexual, transgender and queer community. The group says they're "dedicated to organizing and fighting for a socialist revolution in the United States and around the world." The group said it destroyed the statue hoping to "take down white supremacy." "The people decided to take matters into our own hands and remove the statue," said Takiyah Thompson, a member of Workers World Party and student at N.C. Central University, who climbed to the top of the statue to tie a rope around its neck before the crowd tore it down. "We are tired of waiting on politicians who could have voted to remove the white supremacist statues years ago, but they failed to act. So we acted." "Charlottesville and racist monuments across the country are the result of centuries of white supremacy," said Workers World Party Durham branch member Alissa Ellis, who also participated in the Charlottesville protests. "But we cannot ignore the fact that the current Trump administration has emboldened more Nazis, KKK, and white supremacists to target, brutalize, and kill our communities. The White House and its elected white supremacists are just as responsible as hooded Klansmen and racist vigilantes for what happened. They have blood on their hands."